Woo Hoo!! Mardi Gras in an hour. 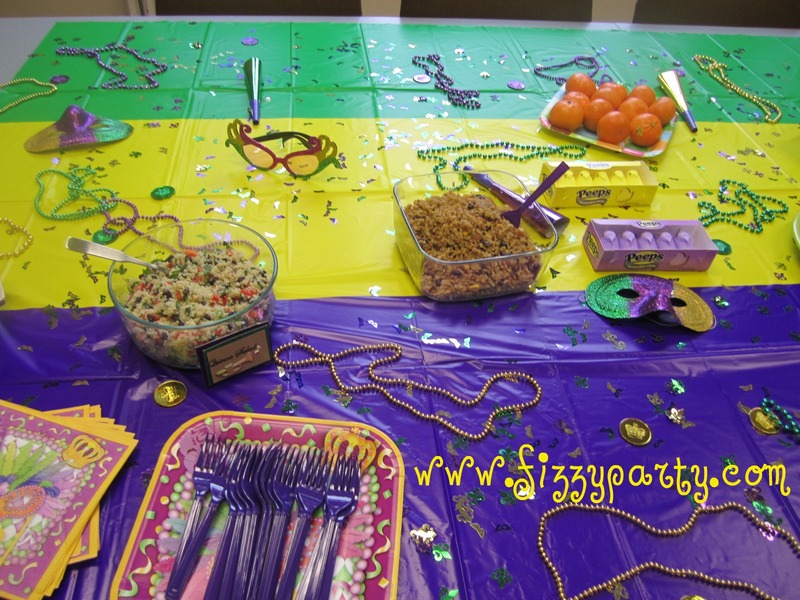 I threw a little Mardi Gras fizzy party at work during the lunch hour for a few friends and co-workers. We had such a fun time and I was asked to throw another one, Woo Hoo!! It was SO hard for me not to go ALL out. But I had to keep in mind that I had to be able to set up and take down quickly. After all, I was working and the room might be needed the next day. So I had to keep decorations easy and simple. Something I could set up in the 15 minutes I arrived at work early and on my 15 minute morning break. SO hard not to go ALL out though. I jazzed up the board a little by writing the famous New Orleans saying, Laissez Le Bons Temps Rouler (Let the Good Times Roll). 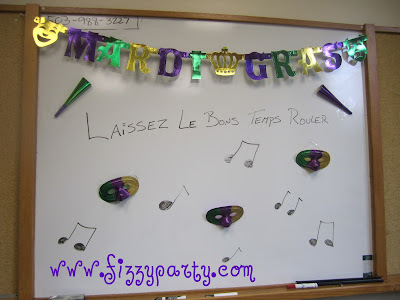 My co-workers were impressed and thought I spoke French, hee hee. 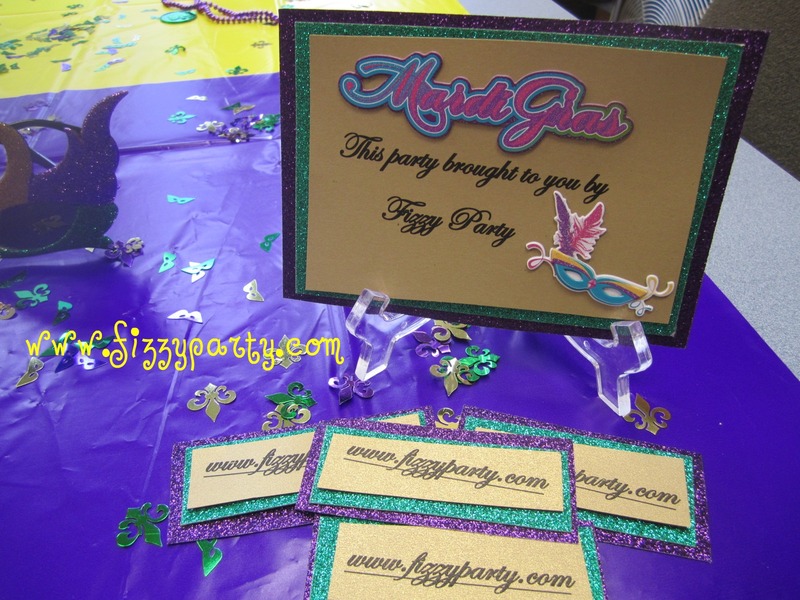 Only if it's party related ;) See my masks I **blinged** up :) Everything you see on the board, Dollar Tree. Great place for party decor. Mmm fruit, so good, Peeps in Mardi Gras coloures!!! Mini Muffulettas and a pasta salad. Think the table SCREAMS Mardi Gras enough ? I think it looks like Bourbon street after the parade floats go by :) Woo Hoo!! 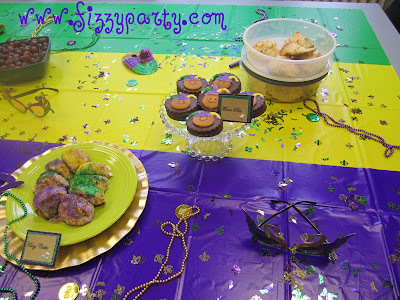 The best end of the table, carbs and SUGAR, mmmm King Cake, Moon Pies and delish garlic cheese rolls. The Jambalaya with spicy Louisiana sausage is missing from these pictures. It showed up after we were all busy stuffing our faces. I was told it was SPICY, BURN your mouth spicy, BRING IT! When it arrived it was hot but could have been hotter ;) You're talking to a girl who can't eat pizza without sprinkling it generously with dried red pepper flakes. Let's take a closer look at some of these Mardi Gras foods, shall we. We shall. 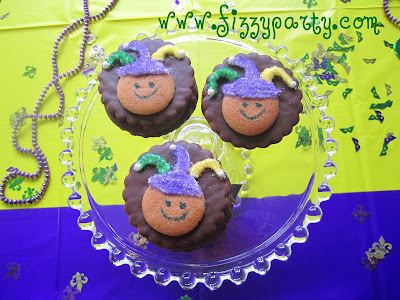 Tradition has it that who ever gets the baby in the King Cake brings the King Cake next year. Well who on earth is going to remember that. So instead I gave out a little prize. I baked 3 babies (oh yes, we had a great laugh over that) but only one was found. 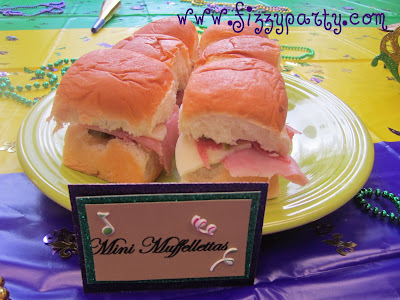 The traditional King Cake. Or in my case, the cheater King Cake. 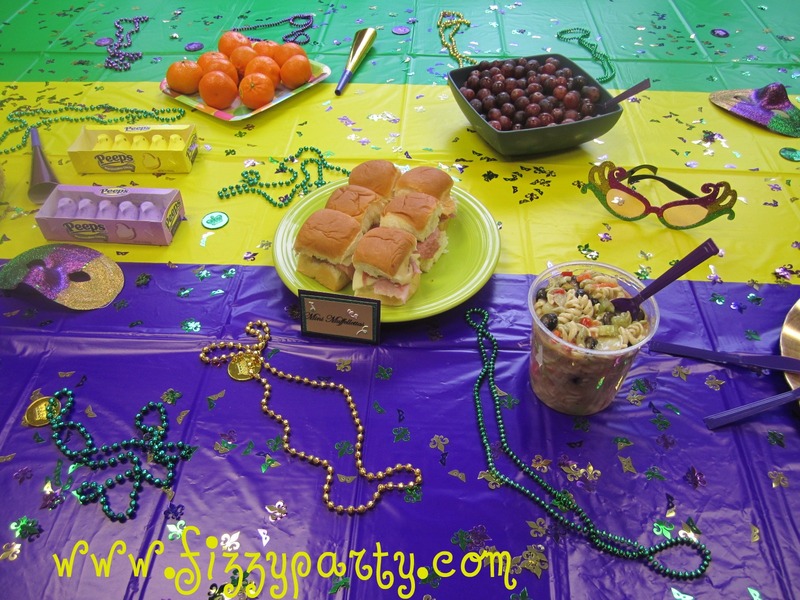 Sandra Lee Semi-Homemade calls it The Big Easy King Cake but I got more laughs and like the sound of cheater King Cake instead. What's the cheat? Cans of Pillsbury cinnamon rolls. SO easy. 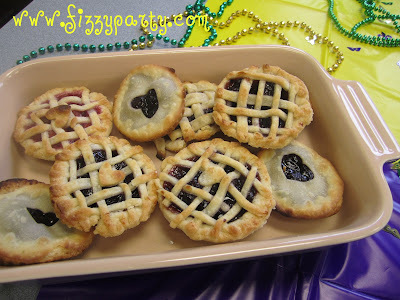 I just stuffed the little babies inside and baked them. More glittery candy sparkles and **blinged** out sign. Throwing a mini party during the lunch hour takes a little more coordination, I don't have the time to set up like I do at home and it all has to come down WAY too soon. But it did break up our day and brought some lightness to a co-worker who otherwise was having a pretty crappy day. My co-workers asked me to throw more and fabulous, will bring food :) I do believe another mini lunch hour work party is in order. St. Patricks Day and Easter...I'm looking at you! Love this Party!! You did an amazing job! Karent, Thank you! 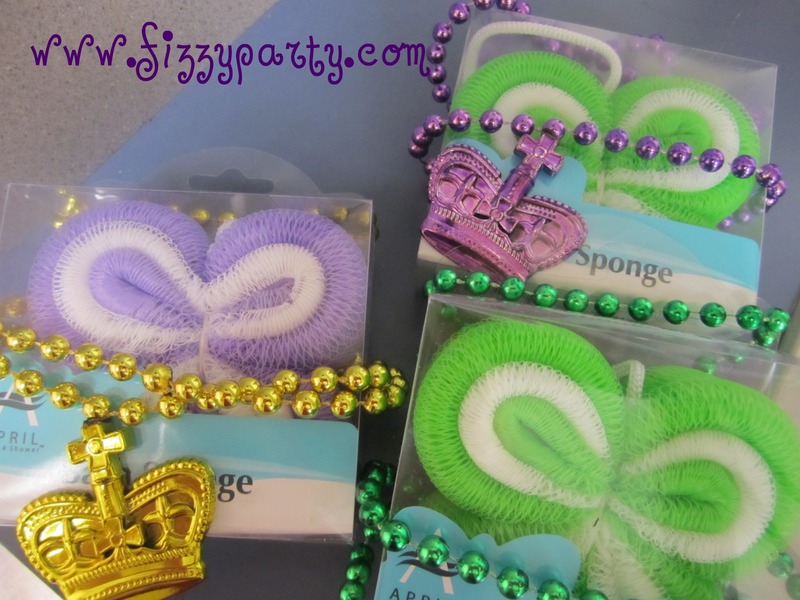 The bath sponges don't have anything to do with Mardi Gras. I just wanted a little something to give to the people who found the baby. They were inexpensive and in Mardi Gras colours. I can't believe you set that up so fast! Well, yes I can. Sounds like it was super fun! Ha ha. Did you forget who you were talking to :) I am Party Diva!